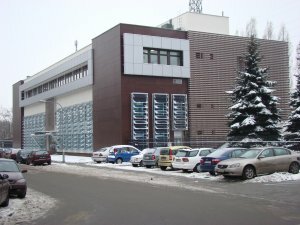 Institute of High Pressure Physics (IHPP), also known as "Unipress", was founded in 1972 by Polish Academy of Sciences. The Institute is directed by Prof. Izabella Grzegory. For the outline of Unipress history please see "history of Unipress" page. Although the original focus of Unipress was on high-pressure studies of semiconductors, the present field of research activities also covers ceramics, HTc superconductors biological materials (high-pressure studies of protein folding, and high pressure food processing) and the plasticity of metals (hydroextrusion). The common axis of these studies is the use of high pressure, both as a research tool (a perturbation like temperature or magnetic field) and also as a technological method (high-pressure sintering, high-pressure growth of crystals). High-pressure method has been always used within Unipress to investigate the properties of semiconductors; by changing the interatomic distances in the crystalline solids we can infer information about the nature of their electronic band structure and defect levels in the material, induce high-pressure phase transitions and shed more light on their vibrational properties. From the application side, high-pressure environments give an opportunity for a continuous change of the properties of semiconductors, making possible the fabrication of tunable devices like pressure tuned lasers. For more than 20 years, Unipress' scientists have worked intensively on the physics and technology of GaN and related semiconductors. This research led to the creation of a unique technology of high-pressure growth of GaN crystals with a dislocation density much lower than crystals grown at atmospheric pressure. This has paved the way to construction of blue/violet laser diodes by using crystals as substrates for growing epitaxial structures of (AlGaIn)N with exceptional structural and optical quality. Both the MBE and MOCVD nitride technology has been developed at UNIPRESS together with the laser-processing lab. The work on blue/violet laser diodes has been done within the Polish Government program titled "The development of the blue optoelectronics", which was coordinated by Unipress. In order to commercialize this technology, new hi-tech focused company was founded. Nanotechnology is a keyword of a modern physics and material sciences. Unipress is involved in nano-studies not only by exploring classical low-dimensional systems like quantum wells and quantum dots but also by working intensively on materials composed of nanograins such as nanoceramics and nanopowders. High-pressure technology plays very important role in the process of sintering of nanopowders, enabling better control of grain size and uniformity, thus leading to the creation of a new generation of advanced materials. The technology to produce nanocrystalline materials is also becoming of increasing importance in the field of high Tc materials, where high pressure technology helps to obtain materials of improved performance. High-pressure techniques have proved very revealing in biophysical studies leading to a number of successful biotechnological applications. The high-pressure tuning of kinetics of protein folding and misfolding allows one to explore protein structural states which are otherwise experimentally inaccessible. Recently, Unipress opened a new laboratory devoted to high-pressure research on protein biophysics. A very important application of high-pressure is food processing, therefore, high pressure steadily takes an increasing hold on the food industry. Unipress pays a lot of attention to the development of high-pressure equipment . We supply high-pressure cells and high-pressure gas-compressors to scientific laboratories all-over the world. The high level of research carried out in IHPP was recognized also by awarding it with two Center of Excellence grants of the European Commission. Besides of these projects we are engaged in many 5th and 6th Framework EU projects, NATO projects (Science for Peace). The scientific staff of IHPP Unipress includes 10 Professors and 27 Research Associates and Postdoctoral fellows. We host 14 Ph.D. students.